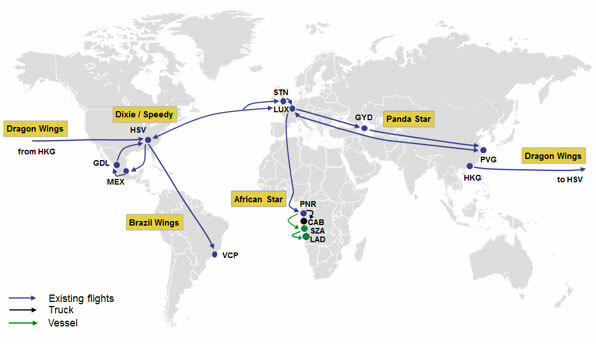 Since 1990 Panalpina has been the only major freight forwarding company to offer its Charter Network for air freight. It is a unique asset that differentiates Panalpina from all other large freight forwarders. The network uses leased and chartered aircraft to guarantee capacity, and is structured to handle express and special shipments. One of the biggest benefits of the network is control, for example when handling temperature sensitive cargo for healthcare customers. Panalpina not only controls aircraft on specific routes, but the company designs and oversees processes on the ground as well, ensuring the best possible control from door-to-door. The network also enables Panalpina to route some of its flights to suit customers’ requirements, if the cargo volume is large enough. The Panalpina Charter Network accounts for approximately 15% of Panalpina’s air freight each year. The map below shows the airports that are currently served by the Panalpina Charter Network. Panalpina’s wet-leased Boeing 747-8 Freighter makes direct calls at five airports: Luxembourg (LUX), Huntsville (HSV), Mexico City (MEX), Guadalajara (GDL) and Stansted (STN). •	Luxembourg-Findel Airport to Huntsville International Airport and back (‘Dixie Jet’ service). When launched 25 years ago, this was a truly pioneering step; never before had a freight forwarding company offered a scheduled cargo service between Europe and North America. •	Luxembourg-Findel Airport to Shanghai Pudong International Airport and back (‘Panda Star’). •	Hong Kong International Airport to Huntsville International Airport (‘Dragon Wings’). Panalpina operates one nose-loading Boeing 747-8F plane that it leases on an ACMI (Aircraft, Crew, Maintenance and Insurance) basis from Atlas Air. It is the backbone of the network. Maximum payload for the aircraft is 140 t and its maximum take-off weight is 442 t.
As part of the Panalpina Charter Network, Panalpina charters either whole aircraft or arranges part-charters. This happens on both a scheduled and ad hoc basis. Given the company’s large presence at Luxembourg Findel Airport, it also has an agreement with Cargolux. Similarly, it has agreements with Atlas Air and other large operators, to ensure that space is always available for customer shipments. The network is ideal for the handling of special cargo such as pharmaceuticals and medical equipment, microchips, oversized oil and gas equipment, helicopters, cars, radioactive and explosive cargo as well as high-value goods. In 2015, around 40% of cargo moved on the Luxembourg-Huntsville route required temperature-controlled shipping. Panalpina manages temperature sensitive shipments end-to-end. Temperatures can be documented in the air, and actively monitored in the transit warehouse and on the road. In instances of unwanted temperature deviations, Panalpina intervenes. Flexibility in timing, routing and delivery mode are key requirements of Panalpina’s customers, particularly in the oil and gas industry. Panalpina’s oil and gas experts can be reached 24/7. They use the network to transport goods to the farthest corners of this world in the most efficient way. The nose-loading capability of Panalpina’s Boeing 747-8 Freighter is very useful for shipping oil and gas industry goods. Depending on a customer’s need, Panalpina also regularly charters other types of aircraft such as the MD-11, Antonov-12, Antonov-124 and Ilyushin-76. Panalpina’s Charter Network has the flexibility to overcome any emergency issue that could cause costly production downtime, for example in the oil and gas and automotive industries. The shutdown of an oil rig or assembly line is the worst case scenario for any company in these industries. To prevent this from happening, Panalpina deploys on-board couriers, part and full charter aircraft, helicopters or any combination of transport methods for urgent shipments. The on-board courier is a service where a courier carries the time-critical shipment on-board a passenger flight as baggage. With almost 500 on-board courier services deployed every year, Panalpina is a market leader in this field. The company’s air cargo gateways in Luxembourg and Huntsville are crucial to the smooth flow of the network. Both are large, sophisticated facilities and – importantly – are situated at airports with minimal congestion in terms of passenger flights and overall numbers of aircraft movements. Panalpina has experienced and dedicated staff at both facilities. Working in conjunction with the network is a Road Feeder Service (RFS). The RFS links Luxembourg and Huntsville with other major centers and offers assured, scheduled road transport between the gateways and Panalpina stations in Europe and the U.S. In Europe alone, the RFS undertook over 35,000 journeys and covered 20 million km in 2015. 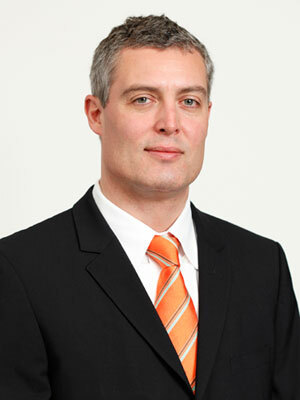 Lucas Kuehner is a seasoned logistics professional with extensive knowledge in international supply chain management. Since December 2012 Mr. Kuehner is the Global Head of Air Freight of Panalpina, based in Basel, Switzerland. Lucas Kuehner has held several executive level positions within Panalpina since joining in the year 2000 including Managing Director USA and Regional Head of Operations NORAM. Mr. Kuehner’s leadership and problem solving skills, coupled with demonstrated management and business development capabilities, have established him as strategic decision maker and entrepreneurial executive with a proven record of success in highly competitive industries. Mr. Kuehner earned his Master of Science in Logistics and Supply Chain Management (MSc) from Cranfield University (UK) and he has a background in Finance.